Perfect for North-east Saltwater top water fishing for BIG Stripers and Blues! CNC Turned, sealed against water intrusion for maximum durability, and hand painted with a rock hard durable finish! Weighted perfectly for optimum presentation! Machine tied buck tails with Mirage flash for the ultimate in durability! VMC Permasteel 4X strong 4/0 Belly hook, 6/0 tail hook, 150 lb Rosco swivels, 2X strong stainless split rings. The Siwash hooks used on the rear give you the best hook-up! Recessed Holographic eyes for maximum effect! Stainless Steel hardware used when possible! Through wired for maximum strength! Perfect for school blue fin tuna, stripers, LARGE bluefish and many more! Proper presentation of this needle plug is to cast, then slowly retrieve while occasionally twitching the rod tip to impart a "injured baitfish" look to the lure. Keep the rod tip up while reeling and maintain contact with the lure. These needle plugs are fast sinkers tail first, so you can work the bottom easily also if you let them sink. Fish them with a teaser about 2' in front of the lure and they are deadly! Twitch your rod tip after letting them sink to a sandy bottom. Looks like a sand eel hatching and gets the attention of a a striper on the prowl! The perfect plug for surf fishing beaches or jetties all over the world! Excellent for boat fishing too! 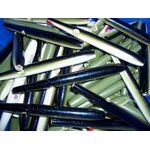 Olive/White mimics a nice size sand eel or needlefish color and size when you see it in the water.. Black/Silver makes a perfect small fish imitation such as medium/large sand eel. Electric Squid is a great color to imitate frightened squid as they flee predator fish in the rips and rocks of the northeast. Yellow or Parrot at sunrise or cloudy days. Black/purple at night with the glow eyes is a killer if you softly light up the eyes in your headlamp. On sunny days I stick with a color that has a high definition color hue change on it....Olive/White, Blue/White, etc. Spend some time looking at the bait prevalent in your area and you will soon understand why certain colors can give you just that little bit extra advantage to entice a larger fish to take your lure. Don't be afraid to use such colors as Olive/White, Blue/White, Parrot, or Yellow/White at night either! We've found that the larger needles work very well from a boat also!